1, 2, 3, 4, 5, 6, & 7. All day yesterday, I scoured the net for great finds to use in the rooms that I'm decorating at my parents' house. 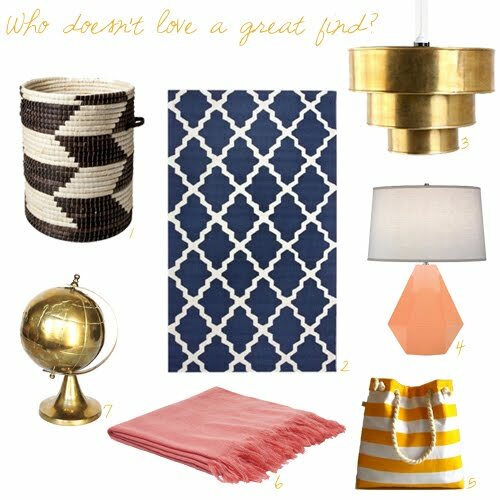 I found some great items that will definitely work for both the basement guest room and the boys' bathroom, but besides finding items for those rooms, I came across these finds that I think just transport you to either an exotic or beach locale. Places that I would much rather be than here in freezing Maryland. On another note, I've reworked a few of the items on the design board that I created for my brothers' bathroom. After talking it over with my mom, we decided to keep the light fixture and mirror on the more traditional/classic side - she didn't want to go too modern in the bathroom. We did keep the accessories modern, but for the main pieces we're sticking to the classics. I'll definitely show you the reworked design board tomorrow so you can let me know what you think. online shopping is the best, you can pretty much be transformed to wherever your heart desires! Can't wait to see your design board for the bathroom. It's so much better shopping online, mainly I can compare prices from other retailers so I know I am getting the best deals!